Enhanced performance Increased dynamic range for Biacore™ T100/T200 instruments. Streamlined workflow One-click integration with TraceDrawer™ software for downstream data evaluation: kinetics, affinity, and more. Text format export to Biacore BIAevaluation and other third-party software. Present users will have the update for free. If you are not a present user, but would be interested in a trial version, please contact us at sales@episentum.com . Season’s Greetings, Merry Christmas and a Happy New Year to all Label-Enhanced SPR friends out there. Do check out our website for some interesting product news early next year! We have published a new price list with reduced prices on most of our Episentec™ dye reagents. Please contact us on sales@episentum.com and we will send you a copy! The Biophysics group at Genentech has published a new paper on the use of ‘chaser’ assays to study extremely long dissociation times, which has been added to our Scientific Publications page. The corresponding poster was honoured with the poster award at the recent GE Healthcare DiPIA 2018 conference in Boston. The Episentum office is open for customer service all summer except weeks 30-31 (23 July – 3 August). We would like to wish all our Customers, Clients, Companions, and Contacts a pleasant, dye-enhanced summer with a yellow sun, blue skies, green trees, and the odd white cloud. We have launched a new version of the EpiGrammer™ software that improves the performance even of top notch SPR instruments. 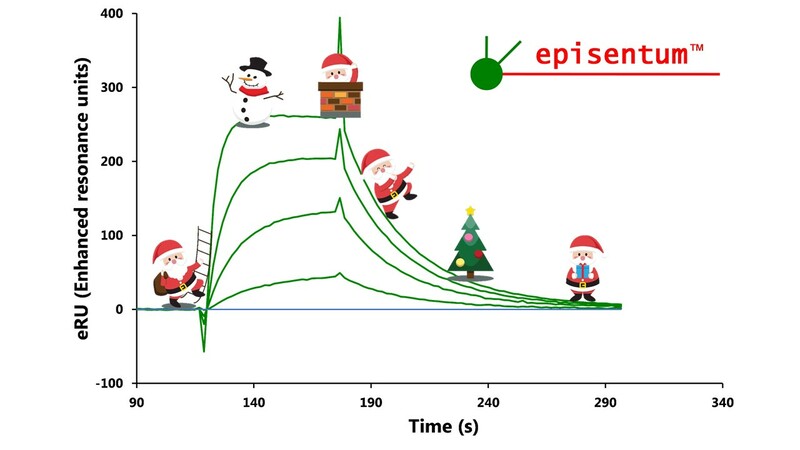 Contact us on sales@episentum.com for a copy of our latest Application Note 26 to learn how the new version improves the signal-to-noise ratio and reduces the disturbance level of the Biacore™ T200 SPR instrument. The new EpiGrammer 3.0 version uses improved algorithms for enhanced performance of Biacore™ T100/T200 systems. We are offering a limited number of free trial licenses to the pilot version of EpiGrammer 3.0 to selected customers. If you’re interested, please contact us on sales@episentum.com. Please check out our new web page listing scientific publications relating to Label-Enhanced SPR and some SPR publications of general background interest! We are happy to offer our Validation Kit B9003 in packs of three for the price of two: €180 in Europe and $220 elsewhere (+ freight). We also include a 1-month free trial license to our EpiGrammer™ software in the package. The offer is valid throughout February 2018. Accurate Surface Plasmon Resonance analysis requires high quality sample injection pulses. Most commercial SPR instruments offer pre-programmed “System Check” procedures that diagnose injection pulse quality in order to detect e.g. leakage, blockage, or dispersion in the microfluidic system. However, such tests are based on pure refractive index measurements, and are plagued by a number of well-known errors and artefacts. LE-SPR offers a rigorous injection test that monitors the true transport of analyte in to and out of the detection flow cell without any refractive index artefacts. Using our LE-SPR Validation Kit, the true shape of injection pulses can be accurately assessed by simple inspection. Learn how by checking out our Technical Note 012. Please contact us at sales@episentum.com for a copy of the TechNote. Season’s Greetings, Merry Christmas and a Happy New Year to all Customers, Clients, Companions & Contacts!